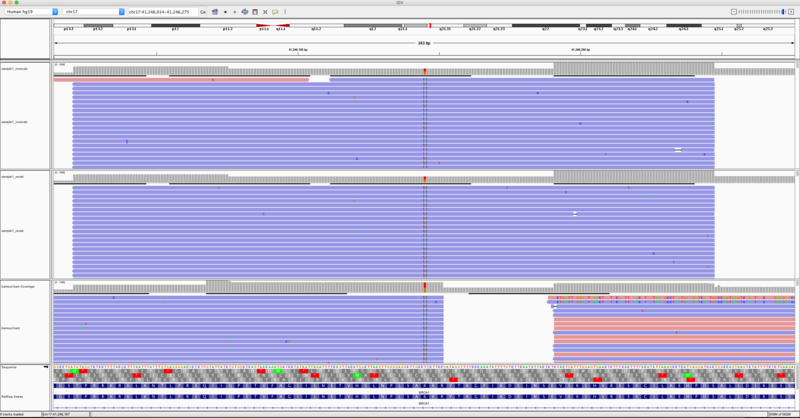 I have analyzed samples sequenced with an Illumina custom amplicon sequencing kit. I used two different strategies: with BQRS and without BQRS and I had different results. In particular using BQRS in two different samples I have 2 variants that are not called by haplotypecaller, I saw them with other callers and they were also validated with Sanger sequencing. Without the BQRS haplotyecaller is able to detect the variants in both cases. My question is: Do you have any experience in this kind of problem? Is there any concerns about using BQRS with amplicon sequencing? Is it better to perform the analysis without BQRS? I have not heard of issues with using BQSR on amplicon data. Can you please post the VCF records for the sites in question? Please also post IGV screenshots of the original BAM file and bamout file for those sites as well. I prepare the data and I will post it as soon as possible! I am posting only one of the two samples mentioned above to be easy. 3. IGV is the screenshot of the 2 bam files (recalibrated and not recalibrated) and the bamout file. The position of interest is chr17:41246145. Do you get the exact same bamout when you run HaplotypeCaller on the two BAMs? Can you please check the base qualities in the recalibrated BAM file and non-recalibrated BAM file? I think the recalibration may have lowered the qualities at that site, so there is no call.